But, things seems different this year. Perhaps it is age, perhaps a little more Yoga, Happiness and Positivity “training” and a little less Canada’s Wonderland in 40 degree heat – just kidding, great times and memories with the kids J ( as you can see from the photo of our visit last summer). It is about appreciating and giving thanks for all of the little things that happen over the summer because it is summer. Because the summer has been warmer this year ( than last), I have been able to do my yoga and meditation at sunrise ( or close to it…lol), grew my best herb garden ever, went strawberry picking at Aide Creek with my son Josh, have enjoyed amazing weekends and sunsets at the cottage with our extended family, kayaked at least once and got out to Pete’s Dam to take advantage of the new bridge which is amazing! My husband , our dog Jammers and myself have enjoyed walking on our glorious Boardwalk most nights of the week. It is wonderful to see so many of you on the Boardwalk and my apologies if our little 6 pound ball of energy has scared your dog or even you. We are actually in the process of securing a dog Whisperer. All we have left to do is camping on Lady Evelyn ( long weekend in September), Boots and Heart CountryFest with my good buddy France Gauthier and the kids ( next weekend), one TGIF and hopefully get out golfing at least once. So, considering the proverbial “cup half full, half empty”, all in all it has been a summer very much half full with the second half ready to fill. It actually has been a wonderful process to write it all down so, if you haven’t done this, give it a shot as you may be surprised by everything you have experienced AND it gets you thinking about what you might want to do before the end of summer. I love cooking blackened fish in the summer as you can cook it outside. You can use any of your favorite fish ( trout, tilapia, haddock, even tuna or salmon but I use primarily trout or tilapia). 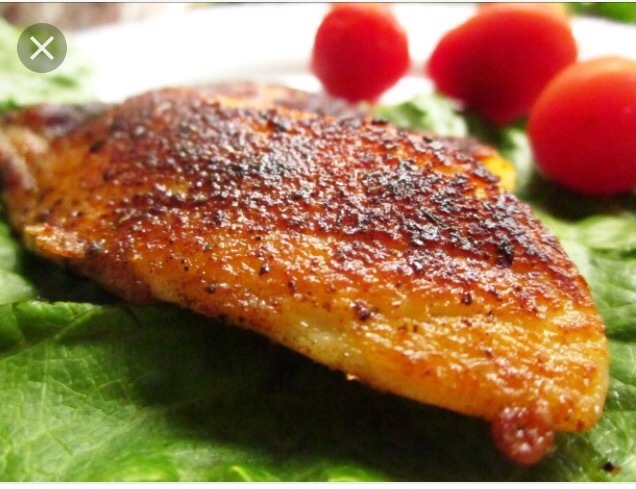 Blackened Fish can be prepared by broiling it ( the healthiest as noted below), grilling it or pan frying using a cast iron pan outside on the barbecue/burner with a little bit of coconut oil which keeps your house smoke-free! 1. Lightly coat a grill rack or the rack of a broiler pan with nonstick cooking spray. Preheat the broiler or grill to medium. 2. In a shallow dish combine paprika, thyme, red pepper, black pepper and allspice. In a small dish stir together butter and oil. 3. Rinse fish, pat dry with paper towel. Cut into 4 serving size pieces. Brush fish with butter mixture. Dip the fish into the spice mix, turning to coat both sides. Place on the broiler pan rack or grill. Tuck under any thin edges of fish. 4. Broil fish 4-5 inches from the heat for 7-9 minutes or until fish flakes with a fork (145F), turning once. 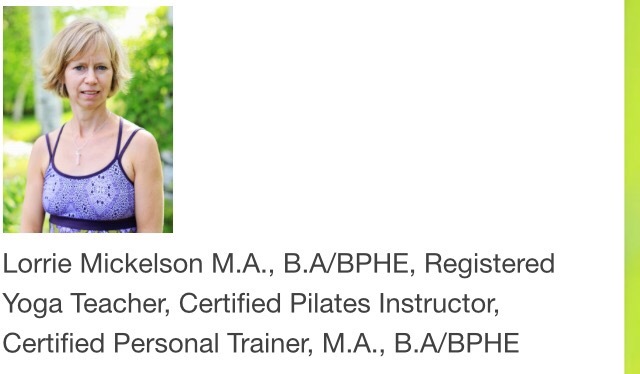 Hi Everyone, please click here for some great info on taking time to check your posture. “Blog Of The Week: A Shout Out To One Foot Forward”. Our last two blog posts have highlighted the amazing fundraising efforts of the New Liskeard Bikers Reunion. At the risk of seeming repetitive, I am feeling in awe of the tremendous effort that went into another recent fundraiser which took place on July 9th in our small community, and wanted to give them a huge shout out today. Kudos to John and Shelly Zubyck who created One Foot Forward: Greyson Zubyck Memorial Dinner, Auction, Golf Tournament and Fun Run. John and Shelly are the loving parents 3 beautiful children. Six months ago they suffered the sudden and painful loss of their adorable middle child, Greyson. 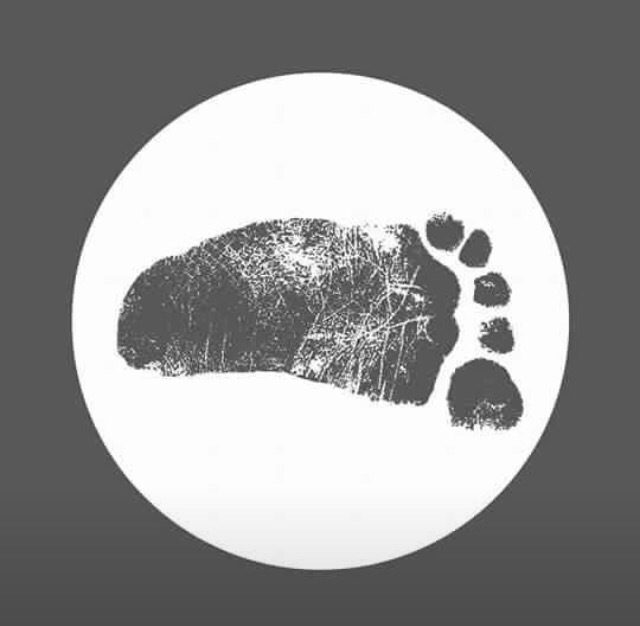 On their journey through grief this incredible idea sprang: a way to honour and remember their beautiful little boy while giving to the community in the form of a memorial fund that supports organizations promoting children’s sports and active living in our community. The fund is linked to the pre-existing Gordon Zubyck Memorial Fund (now the Gordon and Greyson Zubyck Memorial Fund), named for John’s father who was a strong presence in youth athletics in our community throughout his long career as a teacher and coach. Temiskaming Foundation will manage the fund going forward. John and Shelly, with the help of Shelly’s older brother, brainstormed the events of July 9th and have worked tirelessly ever since to create the incredible happening it turned out to be. The Zubycks are very connected in the world of hockey and politics so support for the events went far beyond our local arena. The Prime Minister sent a touching video to John, Shelly and our community which was played at the beginning of the dinner and auction. You can hear his kind words on the One Foot Forward Facebook page. TSN’s Pierre LeBrun also spoke up for the cause on CJTT and highlighted how this cause has touched the hearts of so many in the hockey world. The auction items were outstanding both for the live auction and for the silent auction. I am blown away and inspired by our community’s response to One Foot Forward. Temiskaming Shores rallied behind it, from the committee of people who organized in detail and executed 4 (plus one private) tremendously successful events spanning two days, the army of volunteers that gave their time and energy for the cause, the financial and in-kind support from local businesses and individuals, and the amazing local turn out for the events. In a small community fund raising is ongoing – there is always something worthy to donate to and, in many cases, larger projects would never see light without commitment and financial support from local individuals. But One Foot Forward touched the hearts of so many people on so many levels it was amazing how deep pockets went at the auction!! The final tally of funds raised will be announced soon but at last count the total was +$300 000.00. Way to go One Foot Forward for an incredible success and gift to the children of our community for years to come. If you are interested in donating, please visit one-footforward.com or contact the Temiskaming Foundation. 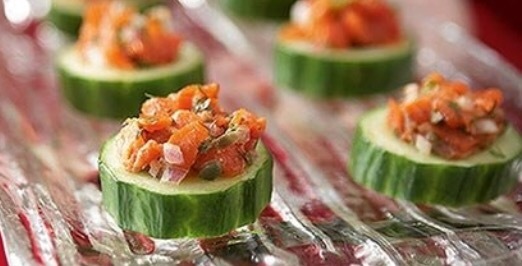 Sliced cucumbers or zucchini make great alternatives to crackers for canapés. So often our summer snacks involve bread, chips or crackers. This appetizer sounds fancy, but is super quick and easy to prepare and has the added bonus of being grain-free. I have substituted parsley for cilantro at times for a different flavour. Also, you can omit the Asian Chili paste and jalapeño. If so, you could switch the lime juice to lemon juice and maybe add a few capers and/or chopped egg (hard boiled). Enjoy!! Trim off and discard the ends of the cucumber. Score the skin with a fork in an attractive pattern or peel decoratively with the pairing knife. Cut the cucumber into half inch (1.25 cm) slices. You should have about 18 pieces. Refrigerate until ready to assemble the canapés. Finally, dice the salmon using a sharp knife and cutting board. Remove 18 cilantro leaves for garnish and chop the remainder. In a bowl combine the salmon and chopped cilantro with all the remaining tatare ingredients except the salt and pepper. Using a large fork,mix well but do not overwork, check the seasoning adding salt pepper and additional chilli paste to taste, cover and chill for at least 1 hour before assembling. Using a melon baller, scoop out the seeds and soft flesh from the cut side of each cucumber piece, forming a rounded hollow but making sure to leave a solid bottom. Place a heaping teaspoon (5ml) of the tartare mixture in each hollow and garnish with a cilantro leaf. Arrange attractively on a serving platter. Nutritional Value (3 pieces): Calories: 78, Protein: 4.6g, Fat: 5.6g, Carbs: 2.5g. Here at Balanced Motion, we are all about community. Because so many of our clients and supporters are Biker’s fans and volunteers, we thought you would enjoy this video of France Gauthier’s closing remarks at the 2016 Event! Click Here to watch and listen! I love any recipe with mint (especially when the mint is out of my garden)! The only change I make to this recipe is that I use orange concentrate (instead of mango), or I use a mango nectar. It’s a wonderfully refreshing salad….enjoy! 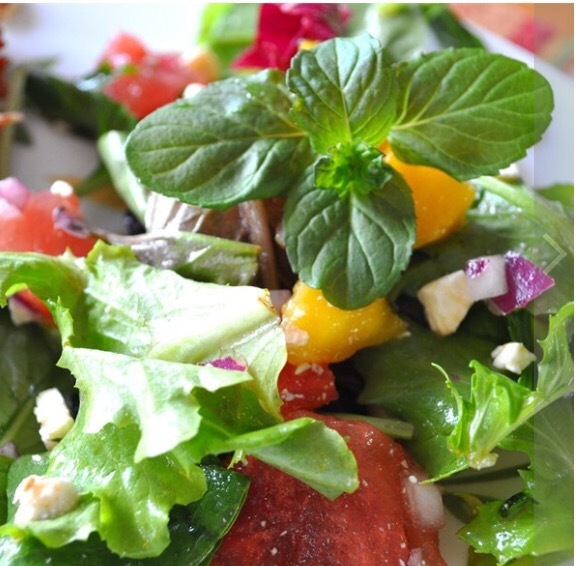 Combine the baby greens, mango, watermelon, mint, feta cheese and minced onion in a mixing bowl. Whisk the vinegar, olive oil and mango juice concentrate together in a small bowl and pour over salad. Toss gently to evenly coat.